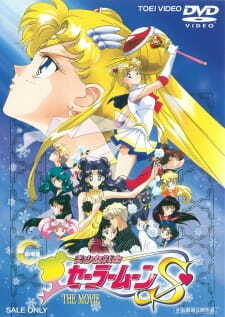 The Sailor Moon movies are a pretty mixed bag. The R movie was thin on story, though it did have some great visuals and a killer ending theme song. I can't stand Chibi-Usa, so you can probably imagine how I feel about the Super S movie. In my opinion, the S movie stands head and shoulders above the other two in almost every way. I'm glad that the focus is on Luna instead of Usagi. Not that I dislike Usagi (quite the opposite), but we get plenty of her in the TV series, so it's nice to see something different. Also, they managed to fit quite a bit of stuff into a short running time without making it feel too rushed. The story isn't the most original or innovative, but it still hits all the right notes. Speaking of hitting all the right notes, the best thing about this movie is the music! It uses all the various musical cues to great effect, without going too over-the-top. My favorite is the beautiful, heartbreaking theme used for Luna-- I cry when I listen to it. The music does a great job of punctuating and enhancing every scene and without it, I don't think I would have enjoyed this movie so much. This movie centers on characters that are frankly usually ignored in the actual series; Luna and Artemis. Story: Ok I'll be honest, the plotline concerning the new supporting characters; the scientists. Confused the heck out of me at first. After watching it for a bit I slowly understood it. They seemed to mix just too much with the past and present, and you have to pay attention. Other then that the story consists mainly about Luna, and you get to find out she and Artemis are more then mere magical cats. Although I was dissappointed they didn't explain as much as the manga did, especially regarding Artemis. It still was a pretty good plot for a plot centered not on the main character, and had touching and funny moments. Art: Once again the art is basic Sailor Moon style but the ending scene is really nice to look at. Especially the transformation sequence ending. Sound: Sound wasn't so much of a deal. Didn't have breakthrough songs, and the sounds the Snow Dancers made her ear-bleeding. Character: I'm going to say it here and now. The reason why I liked this movie was Luna's outcome at the end. I didn't care much for the supporting characters, and the main characters were hardly present. Another good point was the outer scouts made a believable appearence in this movie. Although Saturn didn't appear, there's a good reason why. ( She still didn't make her appearence in the series at the time.) There was also some Mask, Moon and Mini Moon moments too squeezed in. Enjoyment: I liked the movie, and thought it was cute too see Luna in a new way. Plus Artemis was adorable. It also is a important movie to see before SuperS in order to make it more enjorable too. Overall: A cute fluffy movie, but overall nothing huge. As you can see, this is one of my favorite Movie out of the whole three movies that came out and here is why! 1. It is actually based off the manga, though in my opinion the manga was way better (you even get to see a party in the beginning of the manga as well as Usagi using the Luna Pen, which she hasn't used in a long time! 2. I happen to like Luna, who some may think is a nag, but at least she does care for Usagi and is actually quite useful in a lot of ways. Anyways, this is based mainly on Luna. 3. C'mon, you just gotta love the plot as well as the background music and the characters and villians too. And may i say, the artwork is gorgeous! It's about a guy named Kakeru, who dreams of going up to the moon And dreaming of a princess from the moon named Kaguya, who he is fascinated by. He is a scientist who has deep feelings for his childhood friend and partner, Himeko, who secretly loves him in return. Anyways, Luna begins to fall in love with Kakeru after saving her from getting ran over, during which she caught a cold and stuff. Anyways, Luna falls in love with Kakeru and a love triangle forms in front of them and Himeko. Meanwhile Earth is being controlled by a snow demon named Kaguya also, who wants to take revenge on Earth and stuff. It's a really good movie that is my favorite out of them all, and i recommend in buying the movie as well as watching the movie too. You'll love it!